Everybody wants bigger arms and we get that. But the thing many dedicated bodybuilders tend to forget is that regardless of how great it feels to have greatly developed biceps, you shouldn’t neglect the rest of the muscles in the arm. In fact, if you want to build truly admirable arms, you need to train every muscle in the arm with the same volume and intensity as you do your biceps. Nobody admires guys with ridiculous muscle imbalances, so it’s crucial to create a balanced approach to training arms that won’t leave any muscle behind. Here are our suggestions. Enter the king of triceps builders. Tricep dips help you target all three triceps heads at once with a heavy load which translates to a maximal recruitment of muscle fibers and more growth. Dips are complex in that they require movement of a number of joints and thereby promote the development of multiple muscle groups at the same time. So before even thinking of doing triceps isolation exercises, give your triceps a nice burn with this potent move. Depending on your level of strength, you can perform triceps dips on a bench or using a set of parallel bars, mostly found on an assisted pull-up/dip machine. If you’re a beginner, start with a weight that’s roughly two thirds of your original body weight until you get the hang of it. Approach the machine with your arms fully extended on both sides, then wrap your fingers around the outside of the parallel bars with your thumbs on the inside. Your wrists should be angled so that they allow the elbows to bend backwards. Hold your body at arm’s length with arms nearly locked above the bars. Slowly lower yourself down with an upright torso until your biceps touch your forearms and your triceps are fully stretched. The elbows should stay close to your body. Press yourself up, squeezing your triceps. If you’re a beginner, perform 3 sets of 8-10 reps. As your strength increases, progress to 5 sets of 10 reps. The triceps pushdown is a thorough and balanced exercise which should be an essential part of any triceps program. It hits all three heads of the triceps, but emphasizes the lateral and medial heads slightly more than the long one, while also working your shoulders, abs and upper back. If used regularly, this move will help you build stronger and more toned triceps with the much sought-after ‘horse shoe’ shape. While there are many ways do it, performing it with a rope attachment helps isolate the triceps better and achieve optimal contraction. Additionally, the rope enables you to target fibers that lie deep within the triceps and move through a greater range of motion. In fact, one 2011 study found that the rope triceps pushdown was more effective than the bar pushdown when it comes to recruiting triceps muscle fibers. Pick a moderate weight and attach a rope attachment to a high pulley on a cable machine. Grab both ends of the rope with a neutral grip (palms facing each other) and stand upright with a straight torso and a very slight inclination forward. Bring the upper arms close to your body and have your forearms point up towards the pulley. Squeeze the triceps and pull the rope down, bringing each side of the rope away from the other and to the side of your thighs until your arms are fully extended and perpendicular to the floor. Only the forearms should move while the upper arms remain stationary and close to the torso in order to eliminate any momentum. Hold for a second then bring the rope to the starting position. Perform 5 sets of 12-15 reps.
As far as bicep exercises go, preacher curls are somewhere on the top of the list, especially when you’re looking to fully isolate the biceps. They don’t require heavy weights, are immune to cheating and are the single best way to build a mighty biceps’ peak which will make your arms appear much bigger and fuller. You can perform this exercise with dumbbells, a cable pulley, a barbell or EZ curl bar. When using a bar, a wide grip will help you emphasize the short head while a narrow grip will place more stress on the long head. Find a preacher bench and rest your upper arms on the preacher bench pad with your chest firmly against it. Keeping the chest and arms firmly in place, hold the bar at shoulder length. Slowly lower the bar until your upper arms are fully extended and your biceps are fully stretched. Squeeze the biceps and curl the weight up to the starting position, in line with your shoulders. Hold this position for a couple of seconds, then start lowering the bar again. 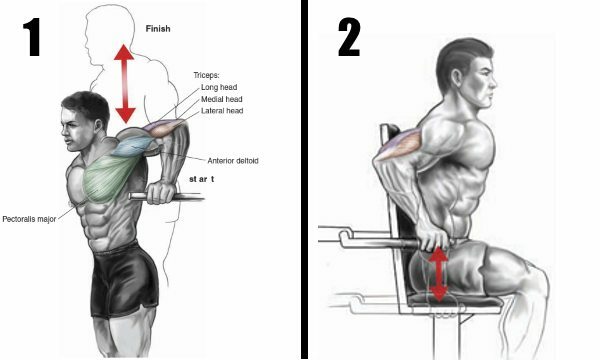 Overhead extensions work great for adding mass to the triceps by targeting all three heads but emphasizing the long head. But the unique benefit of performing overhead extensions with a dumbbell is that this version allows you to isolate all three individual triceps heads to a degree unmatched by a straight bar. Furthermore, if you modify the movement by doing isometric holds at few different points in the range of motion, you can get extra benefits such as improving scapular retraction, correcting poor scapular stability and increasing the range of motion of the shoulders.